Thanks for the post. I haven't seen one of these converted before. Potato pic of my resurrected beamspring. Looking for replacement caps if anyone has any extras! Looks awesome, good luck with finding some keycaps or just use Selectric caps. 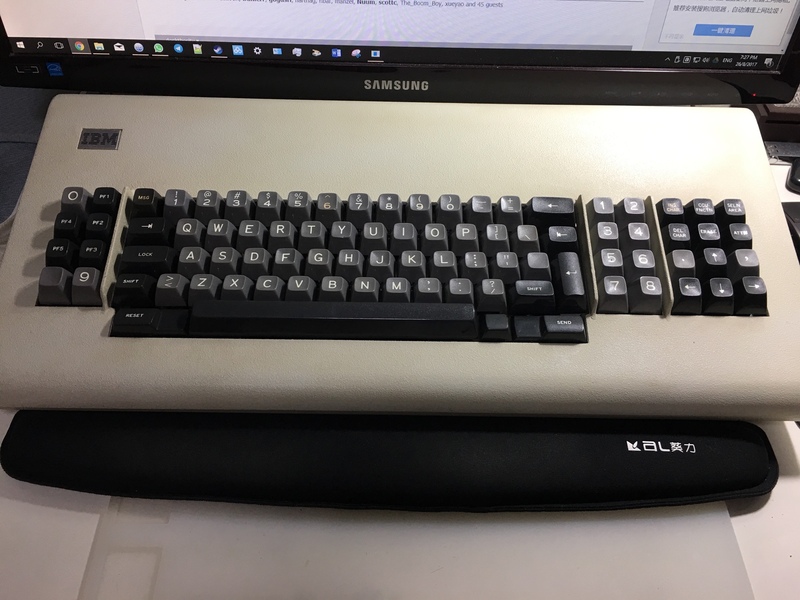 Here's my resurrected 75-key 3278 beamspring. The inside of the top case is marked with the date 10-10-79. All of the switches were disassembled for cleaning and derusting of the switch stems (vinegar bath). The switch plate and bottom switch-housing plate were also derusted. I was originally planning on painting the plates with black hammered Rust-Oleum but decided to leave them bare for now. I would like to try electroplating the plates like this - has anyone on here tried this before? The original foam was also replaced since it was mostly disintegrated. The only issue I ran into was during reassembly when I put all switches in backwards - it was an annoying and tedious fix, especially being so close to thinking you're done with everything. The xwhatsit beamspring controller and solenoid driver work great. Thanks xwhatsit!